The Emu (pronounced /ˈiːmjuː/), Dromaius novaehollandiae, is the largest bird native to Australia and the only extant member of the genus Dromaius. It is also the second-largest extant bird in the world by height, after its ratite relative, the ostrich. The soft-feathered, brown, flightless birds reach up to 2 metres (6.6 ft) in height. The Emu is common over most of mainland Australia, although it avoids heavily populated areas, dense forest, and arid areas. Emus can travel great distances at a fast, economical trot and, if necessary, can sprint at 50 km/h (31 mph) for some distance at a time. They are opportunistically nomadic and may travel long distances to find food; they feed on a variety of plants and insects. The Emu subspecies that previously inhabited Tasmania became extinct after the European settlement of Australia in 1788; and the distribution of the mainland subspecies has been influenced by human activities. Once common on the east coast, Emu are now uncommon; by contrast, the development of agriculture and the provision of water for stock in the interior of the continent have increased the range of the Emu in arid regions. Emus are farmed for their meat, oil, and leather. The Emu was first described under the name of the New Holland Cassowary in Arthur Phillip's Voyage to Botany Bay, published in 1789. The species was named by ornithologist John Latham on a specimen from the Sydney, Australia area, which was referred to as New Holland at the time. He collaborated on Phillip's book and provided the first descriptions of and names for many Australian bird species; its name is Latin for "fast-footed New Hollander". The etymology of the common name Emu is uncertain, but is thought to have come from an Arabic word for large bird that was later used by Portuguese explorers to describe the related Cassowary in Australia and New Guinea. In Victoria, some terms for the Emu were Barrimal in the Dja Dja Wurrung language, myoure in Gunai, and courn in Jardwadjali. It was known as murawung or birabayin to the local Eora and Darug inhabitants of the Sydney basin. 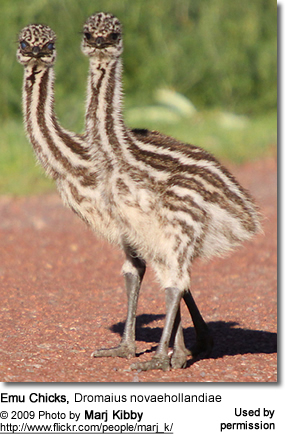 The Emu was classified in the family with their closest relatives the cassowaries in the family Casuariidae in the ratite order Struthioniformes. However an alternate classification has been recently adopted splitting the Casuariidae into their own order Casuariformes. Three different Dromaius species were common in Australia before European settlement, and one species is known from fossils. The small Emus — Dromaius baudinianus and D. ater — both became extinct shortly after; however, the Emu, D. novaehollandiae, remains common. The population varies from decade to decade, largely dependent on rainfall; it is estimated that the Emu population is 625,000–725,000, with 100,000–200,000 in Western Australia and the remainder mostly in New South Wales and Queensland. D. novaehollandiae diemenensis, a subspecies known as the Tasmanian Emu, became extinct around 1865. 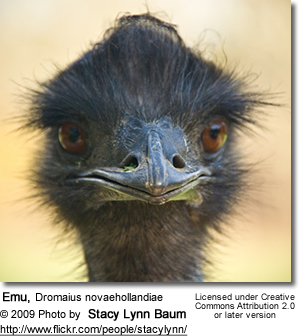 Emus were introduced to Maria Island off Tasmania and Kangaroo Island near South Australia during the 20th century. The Kangaroo Island birds have established a breeding population there. The Maria Island population became extinct in the mid-1990s. In the southwest, D. novaehollandiae rothschildi, darker, with no ruff during breeding. Emus are large birds. The largest can reach up to 150 to 190 centimetres (59–75 in) in height 1 to 1.3 metres (3.3–4.3 ft) at the shoulder. 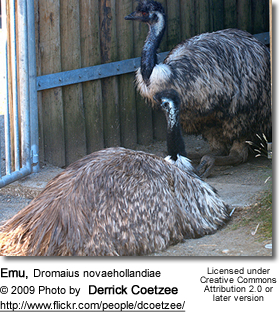 Emus weigh between 18 and 48 kilograms (40 and 110 lb). They have small vestigial wings and a long neck and legs. Their ability to run at high speeds, 48 km/h (30 mph), is due to their highly specialised pelvic limb musculature. 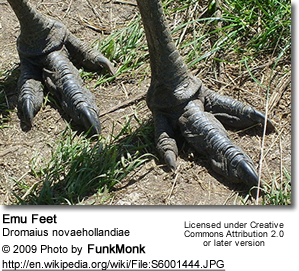 Their feet have only three toes and a similarly reduced number of bones and associated foot muscles; they are the only birds with gastrocnemius muscles in the back of the lower legs. The pelvic limb muscles of Emus have a similar contribution to total body mass as the flight muscles of flying birds. They have a soft bill, adapted for grazing. The neck of the Emu is pale blue and shows through its sparse feathers. They have brown to grey-brown plumage of shaggy appearance; the shafts and the tips of the feathers are black. Solar radiation is absorbed by the tips, and the loose-packed inner plumage insulates the skin. The resultant heat is prevented from flowing to the skin by the insulation provided by the coat, allowing the bird to be active during the heat of the day. A unique feature of the Emu feather is its double rachis emerging from a single shaft. Males and females look alike in appearance. On very hot days, Emus pant to maintain their body temperature, their lungs work as evaporative coolers and, unlike some other species, the resulting low levels of carbon dioxide in the blood do not appear to cause alkalosis. For normal breathing in cooler weather, they have large, multifolded nasal passages. Cool air warms as it passes through into the lungs, extracting heat from the nasal region. On exhalation, the Emu's cold nasal turbinates condense moisture back out of the air and absorb it for reuse. Their calls consist of loud booming, drumming, and grunting sounds that can be heard up to two kilometers away. The booming sound is created in an inflatable neck sac that is 30 cm (12 in) long and thin-walled. Emus live in most habitats across Australia, although they are most common in areas of sclerophyll forest and savanna woodland, and least common in populated and very arid areas, except during wet periods. Emus predominately travel in pairs, and while they can form enormous flocks, this is an atypical social behaviour that arises from the common need to move towards food sources. Emus have been shown to travel long distances to reach abundant feeding areas. In Western Australia, Emu movements follow a distinct seasonal pattern — north in summer and south in winter. On the east coast their wanderings do not appear to follow a pattern. Emus are also able to swim when necessary. Though an Emu will be cautious when approaching civilisation, Emus are well known for approaching small groups of humans in the wild when prompted by food, in fact, even if the food is not offered to them they can be rather persistent in helping themselves. They are also known for violent behavior towards humans, and may attack without notice. According to National Geographic there have been 120 reported emu attacks in the past year, five of them were deadly. Emus forage in a diurnal pattern. They eat a variety of native and introduced plant species; the type of plants eaten depends on seasonal availability. They also eat insects, including grasshoppers and crickets, lady birds, soldier and saltbush caterpillars, Bogong and cotton-boll moth larvae and ants. In Western Australia, food preferences have been observed in travelling Emus: they eat seeds from Acacia aneura until it rains, after which they eat fresh grass shoots and caterpillars; in winter they feed on the leaves and pods of Cassia; in spring, they feed on grasshoppers and the fruit of Santalum acuminatum: a sort of quandong. Emus serve as an important agent for the dispersal of large viable seeds, which contributes to floral biodiversity. Emus also require pebbles and stones to assist in the digestion of the plant material. Individual stones may weigh 45 g (1.6 oz) and they may have as much as 745 g (1.64 lb) in their gizzard at one time. They also eat charcoal, however scientists still have not ascertained why. Emus form breeding pairs during the summer months of December and January, and may remain together for about five months. Mating occurs in the cooler months of May and June. During the breeding season, males experience hormonal changes, including an increase in luteinizing hormone and testosterone levels, and their testicles double in size. Males lose their appetite and construct a rough nest in a semi-sheltered hollow on the ground from bark, grass, sticks, and leaves. The pair mates every day or two, and every second or third day the female lays one of an average of 11 (and as many as 20) very large, thick-shelled, dark-green eggs. The number of eggs varies with rainfall. The eggs are on average 134 by 89 millimetres (5.3 in × 3.5 in) and weigh between 700 and 900 grams (1.5 and 2.0 lb), which is roughly equivalent to 10–12 chicken eggs in volume and weight. 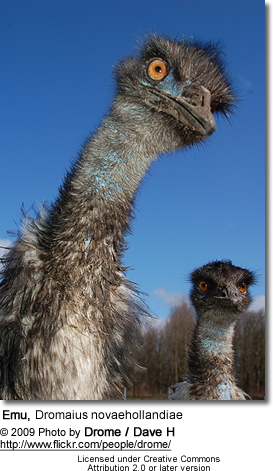 The first verified occurrence of genetically identical avian twins was demonstrated in the Emu. The male becomes broody after his mate starts laying, and begins to incubate the eggs before the laying period is complete. From this time on, he does not eat, drink, or defecate, and stands only to turn the eggs, which he does about 10 times a day. Over eight weeks of incubation, he will lose a third of his weight and will survive only on stored body-fat and on any morning dew that he can reach from the nest. As with many other Australian birds, such as the Superb Fairy-wren, infidelity is the norm for Emus, despite the initial pair-bond: once the male starts brooding, the female mates with other males and may lay in multiple clutches; thus, as many as half the chicks in a brood may be fathered by others, or by neither parent as Emus also exhibit brood parasitism. Some females stay and defend the nest until the chicks start hatching, but most leave the nesting area completely to nest again; in a good season, a female Emu may nest three times. Incubation takes 56 days, and the male stops incubating the eggs shortly before they hatch. Newly hatched chicks are active and can leave the nest within a few days. They stand about 12 centimetres (5 in) tall, weigh 0.5 kg (18 oz), and have distinctive brown and cream stripes for camouflage, which fade after three months or so. The male stays with the growing chicks for up to 7 months, defending them and teaching them how to find food. Chicks grow very quickly and are full-grown in 5–6 months; they may remain with their family group for another six months or so before they split up to breed in their second season. In the wild, Emus live between 10 to 20 years; captive birds can live longer than those in the wild. Emus were used as a source of food by indigenous Australians and early European settlers. Aborigines used a variety of techniques to catch the bird, including spearing them while they drank at waterholes, poisoning waterholes, catching Emus in nets, and attracting Emus by imitating their calls or with a ball of feathers and rags dangled from a tree. Europeans killed Emus to provide food and to remove them if they interfered with farming or invaded settlements in search of water during drought. An extreme example of this was the Emu War in Western Australia in 1932, when Emus that flocked to Campion during a hot summer scared the town’s inhabitants and an unsuccessful attempt to drive them off was mounted. In John Gould's Handbook to the Birds of Australia, first published in 1865, he laments the loss of the Emu from Tasmania, where it had become rare and has since become extinct; he notes that Emus were no longer common in the vicinity of Sydney and proposes that the species be given protected status. Wild Emus are formally protected in Australia under the Environment Protection and Biodiversity Conservation Act 1999. The IUCN rates their status as Least Concern. Their occurrence range is between 1,000,000–10,000,000 km2 (390,000–3,900,000 sq mi), and a 1992 population estimate was between 630,000 and 730,000. Although the population of Emus on mainland Australia is thought to be higher now than before European settlement, some wild populations are at risk of local extinction due to small population size. Threats to small populations include the clearance and fragmentation of areas of habitat; deliberate slaughter; collisions with vehicles; and predation of the young and eggs by foxes, feral and domestic dogs, and feral pigs. The isolated Emu population of the New South Wales North Coast Bioregion and Port Stephens is listed as endangered by the New South Wales Government. 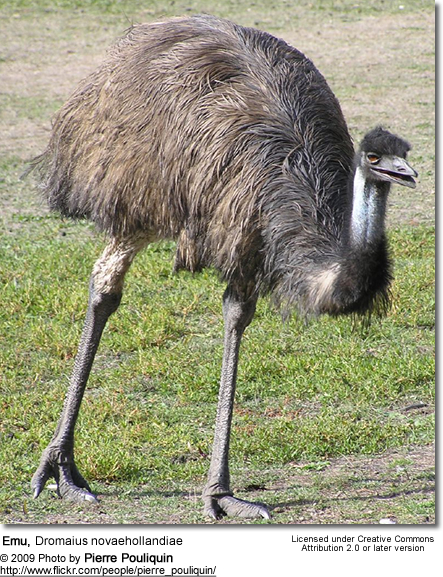 The Emu was an important source of meat to the Aborigines in the areas to which it was endemic. Emu fat was used as bush medicine, and was rubbed on the skin. It also served as a valuable lubricant. It was mixed with ochre to make the traditional paint for ceremonial body adornment, as well as to oil wooden tools and utensils such as the coolamon. Emus are farmed primarily for their meat, leather, and oil. Emu meat is a low-fat meat (less than 1.5% fat), and with cholesterol at 85 mg/100 g, it is comparable to other lean meats. Most of the usable portions (the best cuts come from the thigh and the larger muscles of the drum or lower leg) are, like other poultry, dark meat; Emu meat is considered for cooking purposes by the USDA to be a red meat because its red colour and pH value approximate that of beef, but for inspection purposes it is considered poultry. Emu fat is rendered to produce oil for cosmetics, dietary supplements, and therapeutic products. There is some evidence that the oil has anti-inflammatory properties; however, the US Food and Drug Administration regards pure Emu oil product as an unapproved drug. Emu leather has a distinctive patterned surface, due to a raised area around the feather follicles in the skin; the leather is used in such small items as wallets and shoes, often in combination with other leathers. The feathers and eggs are used in decorative arts and crafts. The Emu has a prominent place in Australian Aboriginal mythology, including a creation myth of the Yuwaalaraay and other groups in NSW who say that the sun was made by throwing an Emu's egg into the sky; the bird features in numerous aetiological stories told across a number of Aboriginal groups. The Kurdaitcha man of Central Australia is said to wear sandals made of Emu feathers to mask his footprints. 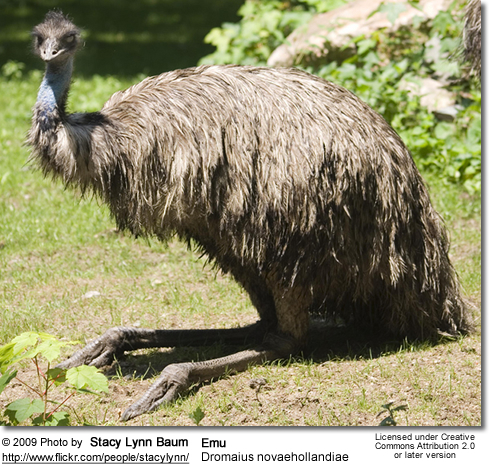 The Emu is popularly but unofficially considered as a faunal emblem—the national bird of Australia. It appears as a shield bearer on the Coat of arms of Australia with the Red Kangaroo and as a part of the Arms also appears on the Australian 50 cent coin. It has featured on numerous Australian postage stamps, including a pre-federation New South Wales 100th Anniversary issue from 1888, which featured a 2 pence blue Emu stamp, a 36 cent stamp released in 1986, and a $1.35 stamp released in 1994. The hats of the Australian Light Horse are famously decorated with an Emu feather plume. 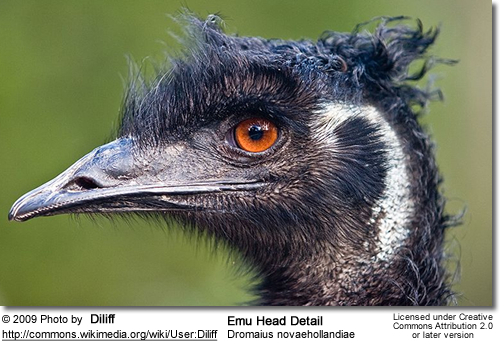 There are around 600 gazetted places named after the Emu in Australia, including mountains, lakes, creeks, and towns. During the 19th and 20th centuries, many Australian companies and household products were named after the bird; for example, in Western Australia, Emu branded beer has been produced since the early 20th century. The Swan Brewery continues to produce a range of Emu branded beers. Emu - Austral Ornithology is the quarterly peer-reviewed publication of the Royal Australasian Ornithologists Union, also known as Birds Australia. The Emu, along with the Kangaroo are the mascots of the cross-country snowboarding team of Whyalla in South Australia.